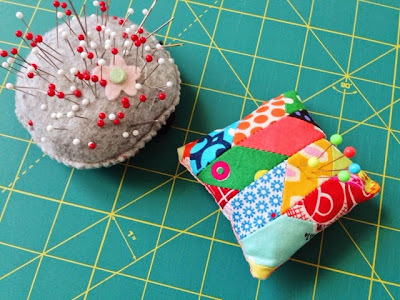 I've been using the cheap felt pincushion on the left for almost ten years, when I bought it thinking it would hold me over until I could make something better. Years and years later, I am so sick of using that thing! I've been constantly reminded of how much I dislike it while doing lots of handwork for the Trip Around the World Challenge, and despite falling a bit behind on the challenge, I just had to whip out a new one before I could sew another stitch. I'm quite pleased with the way the chevron pattern worked out, and hey! now I can use those colorful straight pins I had been saving for no good reason. This weekend it's down to work!